the drilled distance from the underground heading. (i) Downhole width. True width to be determined. Commenting on the latest results, Gil Playford, GBS Gold's Chairman and CEO, said: "The drilling results within the Brocks Creek underground mine are very encouraging as they demonstrate the potential to extend the life of this mine which provides high grade ore to the Union Reefs plant. At Fountain Head, our geological team has done excellent work in delineating robust zones of high grade mineralization which should enable this area to deliver increased tonnages and gold production going forward." The Brocks Creek underground mine is located approximately 75km by road from the Union Reefs gold plant, and hosts an indicated resource of 140,000 tonnes at 18.1g/t containing 81,700 ounces of gold, and an inferred resource of 69,000 tonnes at 8.3g/t containing 18,500 ounces of gold. Mining commenced in the Brocks Creek underground operation in late 2006 and has since progressed to approximately 270 metres below surface at the 825 Level. Since the start of 2007, the mine has produced approximately 159,000 tonnes at an average gold grade of 11.6g/t for production of approximately 56,000 ounces. 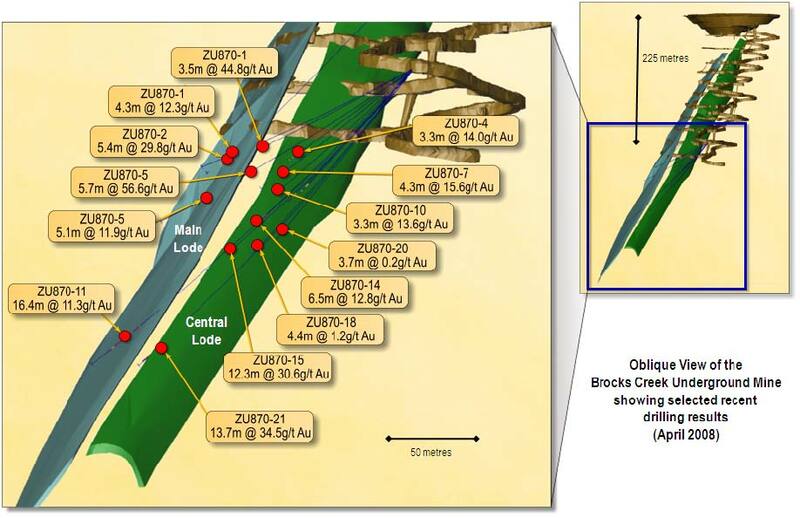 The majority of this gold production has been sourced from the Main Lode of the Brocks Creek orebody, and the latest indications are that the adjacent Central Lode is increasing in size and grade with depth. Drilling from the underground workings at the 870 level approximately 225 metres below surface has recently been undertaken with the objective of testing for depth extensions of the Main Lode and, in particular, deeper levels in the Central Lode. Significant results are set out on page 1 of this news release, and are fully tabulated in Attachment 1. The results received are depicted graphically below. Results indicate that the Central Lode of the Brocks Creek orebody is increasing in strike length, grade and true width with depth. Additional encouraging intersections in the Main Lode have also been received. Drillhole ZU870-11 returned an average grade of 11.3g/t gold in the Main Lode from an area where a grade of 6.0g/t gold was predicted by the existing resource model. It would therefore appear that localized upgrading of the resource is occurring. This information will form the basis of a new block model and resource estimate. A planned drill access drive from the 810 Level will enable future drilling to both intersect the ore body at an optimum angle and to obtain drill coverage for a further 200 metres vertical depth beyond the current known resource limits. Mining operations continue at the Fountain Head open pit, into both the anticline and adjacent Tally Ho lode structures. Since open pit mining operations commenced at Fountain Head in early 2007, a total of approximately 896,000 tonnes at an average gold grade of 1.6g/t has been mined from the Fountain Head and Tally Ho lodes for production of approximately 43,000 ounces. 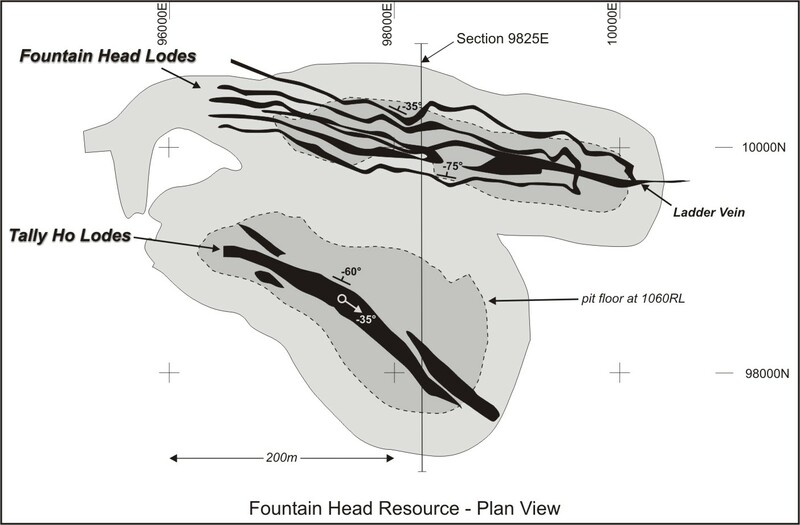 The current resource estimate for the Fountain Head deposit, including the Tally Ho lode structures, comprises indicated resources of 1,483,000 tonnes at 1.7g/t for 78,400 ounces of contained gold, plus inferred resources of 524,000 tonnes at 1.8g/t for 30,500 ounces of contained gold. 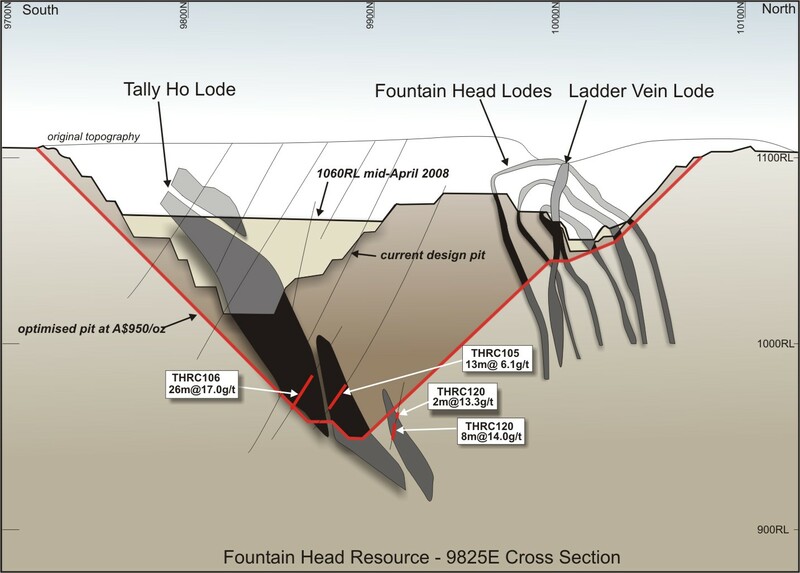 Since December 2007, drilling has continued in the Tally Ho lodes which are located on a shear zone diverging from the main Fountain Head anticline lode structures. As well as significantly expanding the Fountain Head open pit resource, the Tally Ho lodes are interpreted to represent the near-surface expression of a larger and previously overlooked gold system. Recent results received from drilling into the Fountain Head Tally Ho lodes are from 18 reverse circulation drillholes for a total of 2,820 metres. Significant intersections are set out on page 1 of this news release, and are tabulated in detail in Attachment 1. This drilling targeted the lower portion of the interpreted resource depth extensions with the objective of defining additional ore material that would extend the Fountain Head open pit mine life. 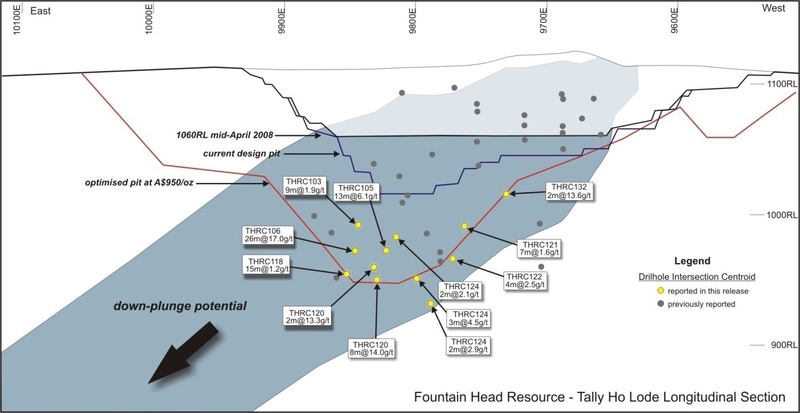 Although further drilling is required, these drilling results suggest that a cut-back to the existing open pit is economically feasible and indicate an increase in the average grade of the Tally Ho lodes with depth. Refer the graphics below and on the next page. In particular, drillhole THRC106 (26 metres at 17.0g/t from 118 metres downhole) intersects below the current resource model limits. A new resource block model containing the recent drilling is being compiled and will be used for mine planning. In addition to the extended open pit potential, the higher grade tenor and significantly increased true widths of up to 14 metres, suggests that there may also be scope for deeper mineralization that might support an underground mining operation. The Tally Ho lodes are open down dip and along strike. Further drilling is planned to test these zones and to further increase the contained ounces within the Tally Ho lodes. About GBS Gold International Inc.
GBS Gold is an emerging gold producer with 2.4Moz of Indicated Resources and 1.6Moz of Inferred Resources of gold at its Union Reefs Operations Centre located in historically productive goldfields in the Northern Territory of Australia. GBS Gold produces gold through its modern dual-mill 2.5Mtpa Union Reefs processing plant. The Company expects to commence production at its Tom's Gully and Cosmo Deeps free-milling projects in 2008-10 to increase production to an annualized rate of up to 250,000 ounces and to construct a GEOCOAT® circuit, a heaped bio-oxidation process, at the Union Reefs plant to treat refractory ores and further increase gold production from the Union Reefs Operations Centre to 300,000 ounces per year. The Union Reefs plant is adjacent to the main Stuart Highway and the trans-continental Adelaide-Darwin railway line, and is on the Northern Territory power grid. Within 125km trucking distance of the Union Reefs plant, GBS Gold has consolidated over 3,500km2 of prospective tenements and gold deposits and also holds gold exploration properties in Western Australia and Canada. GBS Gold trades on the Toronto Stock Exchange under the symbol "GBS". The drilling results and technical disclosures in this news release regarding GBS Gold's properties were approved by Alf Gillman, an employee of GBS Gold and a qualified person under National Instrument 43-101. The Company's mineral resources comprise indicated resources of 22.8 million tonnes at 3.3g/t for 2.4 million ounces of contained gold and inferred resources of 20.3 million tonnes at 2.5g/t for 1.6 million ounces of contained gold. The Company will shortly file a technical report for the updated resource estimate for its non-Tom's Gully properties and the feasibility study and reserve estimate for its Cosmo Deeps project. The Company has filed two technical reports on the Tom's Gully project being a technical report entitled "Form 43-101 Technical Report on the Tom's Gully Project" dated and filed on January 14, 2008 and a technical report entitled "Technical Report on the Mineral Reserves of the Tom's Gully Gold Mine" dated December 2007 and filed on January 31, 2008. The Company has completed a feasibility study on the Tom's Gully Project and declared a probable mineral reserve estimate of 740,000 tonnes at 7.1g/t for 170,000 ounces of contained gold (refer the news release dated December 18, 2007). Other than the feasibility studies completed on the Tom's Gully and Cosmo Deeps projects, the Company has not completed a feasibility study and there is no certainty that its projects will be economically successful. Mineral resources that are not mineral reserves do not have demonstrated economic viability. Any potential updates to GBS Gold's mineral resources discussed in this news release are conceptual in nature and subject to further drilling, analytical and test work and/or data verification. All estimates of updates to mineral resources are based on the drilling results and resource modeling described herein. GBS Gold manages its drilling and assaying activities in accordance with industry standard quality assurance/quality control (QA/QC) procedures. Samples are collected by GBS Gold personnel and prepared in accordance with specified procedures at the relevant assay laboratories. The primary assay laboratory is North Australian Laboratories in Pine Creek, Northern Territory. Laboratory site reviews are undertaken. Assay QA/QC involves the use of assay standards (sourced from reputable suppliers and cross-checked through umpire laboratories), field duplicates, blanks and barren quartz flushes. A third party "umpire" laboratory is used to cross-check and validate approximately 5% of the assay results. Sample coarse rejects are retained and approximately 5% of samples are re-submitted for further assay verification. All sample pulps, half-core and rock-chip samples are retained at site. Certain disclosures in this release, including management's assessment of GBS Gold's plans and projects, constitute forward-looking statements that are subject to numerous risks, uncertainties and other factors relating to GBS Gold's operation as a mineral development company that may cause future results to differ materially from those expressed or implied in such forward-looking statements. The following are important factors that could cause the Company's actual results to differ materially from those expressed or implied by such forward looking statements: fluctuations in gold prices and currency exchange rates; uncertainties relating to interpretation of drill results and the geology, continuity and grade of mineral deposits; uncertainty of estimates of capital and operating costs, recovery rates, production estimates and estimated economic return; general market conditions; the uncertainty of future profitability; and the uncertainty of access to additional capital. Full descriptions of these risks can be found in the Company's Annual Information Form available on the SEDAR website, www.sedar.com. Readers are cautioned not to place undue reliance on forward-looking statements. GBS Gold expressly disclaims any intention or obligation to update or revise any forward-looking statements whether as a result of new information, future events or otherwise. (i)    Results are based on 50g fire assays. (ii)   All results prefixed THRC are from RC drilling (1m intervals). (vi)   All intersections are down hole intervals. (vii)  All deviations have been verified by down hole camera. (viii) Collar co-ordinates are confirmed by survey pickup. The TSX does not accept responsibility for the adequacy or accuracy of the information contained herein. About this company GBS Gold International Inc.